In 1961, the Federal Housing Administration began insuring mortgages on condominiums and ever since, they have been exploding in popularity. Metropolitan cities are responsible for the majority of these structures, but they are widespread throughout many areas. Most of them operate under the direction of a homeowners association, who mandates condo cleaning be performed on an established schedule. This provides a unique opportunity for pressure washing companies to increase their revenue. Defined, a condominium is any large building that provides individual living spaces connected through common use areas. Hallways, heating and plumbing systems, entryways, and elevators are shared features. The primary difference between these and apartment buildings is that condominiums are owned, as opposed to rented units. This makes all owners jointly responsible for condo cleaning. Condominiums can be small single story units with only a few homes, or large multi-story complexes that house hundreds of residences. Technically, they are owned by a corporation that holds the building in trust for the homeowners. Each one has a defined set of rules regarding upkeep of the commonly held areas. 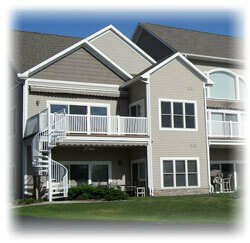 Condo cleaning mandates include the cleaning of exterior siding. Soliciting this type of work is done by approaching the homeowners association or the contracted maintenance company. Direct mail letters are an effective way to introduce a pressure washing company to these organizations. Eventually persistence will pay off. Once contacted, a pressure washing service will need to submit a bid. It is a good idea to create a detailed proposal so that the client will understand exactly what value they are receiving. An award-winning proposal contains specific details of the scope of the work. Issues such as what the community will be responsible for and the manner in which the work is performed is crucial. A list of past clients and testimonials is helpful for establishing credibility. Highlight ways that the company stands out from the competition, such as pressure washing EPA compliance. Documented proof of insurance coverage for condo cleaning and business license numbers should also be included. A contract is another essential item. Issues such as how the resident personal property will be protected, as well as what each party's duties and liabilities are needed. Most pressure washing contractors require that doors and windows remain closed during condo cleaning to protect interiors from overspray. Also of importance is to indemnify the company against water leaks that occur due to faulty or defective construction.Bids for condo cleaning are estimated based on square footage and on what areas are going to be cleaned. A pressure washing company should have a pre-determined idea of hourly operating expense, including chemicals, machine wear and tear, insurance, labor, and travel cost. This is multiplied by the number of hours it would take to complete the job, and then divided by the total square footage. The actual cleaning process is the same as it would be for any smaller house. In addition to the siding, gutters, pools, decks, and walkways can be added to upsell the service. Doing a thorough job will ensure future jobs and earn a valuable reference for future services. The pressure washing businesses is a fantastic industry to be involved in, and there are limitless niches that can be targeted. Condo cleaning is just one way to increase overall revenue, requiring nothing more than just getting a foot in the door. For more information on pressure washing equipment check out our hot water pressure washers page. Increasing gas prices can effect your business. Get the highest quality pressure washing equipment.